High-power lasers are now widely used in additive manufacturing and laser welding systems to precisely cut and weld metal, making all kinds of metal parts for medical devices, aerospace applications, automotive industries, and more. With the rise in industrial use of high-power laser processing, manufacturers increasingly seek high-accuracy, point-of-use laser power meters that can quickly report laser powers at any time in the manufacturing process—a vital aspect to controlling product quality. Traditional laser power meters, however, are often bulky in size and slow in response time. Power measurements can also only be taken separately, interrupting the manufacturing process. Now, a group of researchers from National Institute of Standards and Technology (NIST) in Boulder, Colorado, have developed a smaller, faster and more sensitive laser power meter in the form of a folding mirror they call a "smart mirror." The novel design uses a capacitor-based force transducer and merges optical elements, namely a high reflectivity mirror, and sensing elements into a compact cube package. The four-centimeter-on-a-side cubes can be conveniently embedded into laser optical systems or laser-welding systems for point-of-use, real-time laser power measurement and calibration. The researchers will present their innovation at the OSA Imaging and Applied Optics Congress, being held June 25-28 in Orlando, Florida, United States. "Measuring laser power by measuring the pressure of a laser beam hitting a mirror is a very unique technique, [and] so far it is the only laser power measurement technique that is truly an in-situ process," said Alexandera B. Artusio-Glimpse, a scientist of NIST in Boulder, Colorado, and the primary author. "Unlike any other optical power measurement techniques, our method allows us to continue using the laser for work while a measurement is being taken." Artusio-Glimpse explained that traditional high-power meters measure laser power by absorbing all the energy of a laser beam as heat and measuring the temperature change. The calorimetric measurement has to temporarily stop the laser beam from work for around tens of minutes. "Using our 'Smart Mirror' laser power meter, that stop-measure-continue process is no longer needed. Manufacturers can measure the laser power continuously during every weld and monitor the laser calibration in real time, they would know right away whenever the laser has a problem and wouldn't risk wasting metal parts with bad welds," Artusio-Glimpse said. The Smart Mirror laser power meter is also referred to as a radiation pressure power meter (RPPM), as the operating principle of this meter is based on measuring the pressure of the laser, the radiation pressure. Light has no mass, but it has momentum and when a laser beam strikes an object such as a mirror, it will exert a tiny force known as the radiation pressure on the mirror, which directly relates to the laser power. 200 watts of laser power, for example, exerts a force equivalent to 100 micrograms, which is roughly the weight of a single human eyelash. The key part of the Smart Mirror design is a capacitor-based compact force transducer. It consists of a spiral planar silicon spring supporting a circular plate with a high reflectivity mirror on one side and an electrode on the other. An identical silicon spring with an electrode is placed close to the first spring such that the two electrodes face each other, forming a variable capacitor. A laser beam reflecting off the mirror on the first spring will push the first spring to move toward the second and change the capacitance between the two electrodes. By comparing to a fixed reference capacitor, the researchers can calculate the radiation pressure and laser power. After reflecting off the mirror, the laser beam can be used directly for work, making real-time monitoring of laser power or laser calibration possible. According to Artusio-Glimpse, the team has been developing the novel radiation pressure power meter for years and an earlier version of RPPM employed a commercially available scale with a mirrored surface as a force transducer. The final system was about the size of a shoebox, with a measurement sensitivity of 50 micrograms and response time of five seconds. In the new version of the Smart Mirror, the researchers improved the measurement sensitivity by 100 times and decreased the response time by 50 times. They also mitigated static sagging errors of the device caused by gravity when the device is rotated. 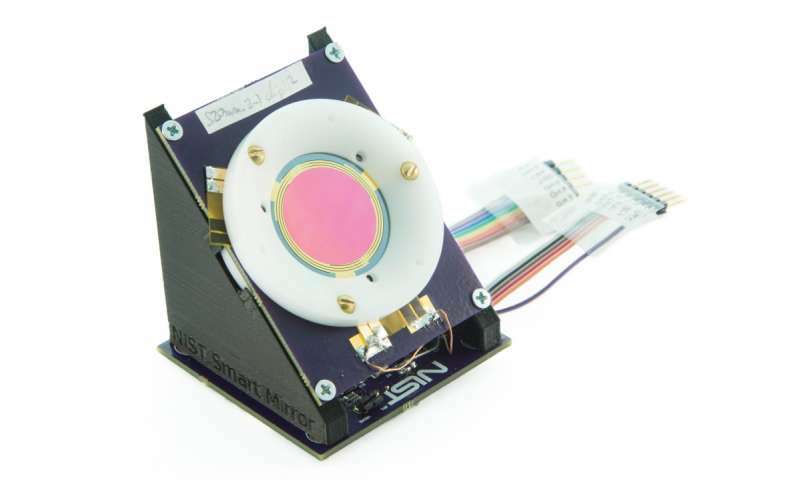 This allows the sensor to be embedded at the end of a robotic arm or in additive manufacturing and laser welding systems where the laser head will move and rotate—a key feature that the early version bulk RPPM lacks. It also meets the measurement requirements of many commercially significant applications. Based on preliminary tests, the new meter is sensitive enough to measure 100 watts of laser power with no more than one percent uncertainty, and with a response time faster than any other absolute high-power laser meter. The researchers are now continuing to validate these results with more tests. Artusio-Glimpse said the NIST team expects to establish a primary standard version of the Smart Mirror laser power meter in the near future. More information: Hear from the research team: ATh2A.2 "Non-Absorbing, Point-of-Use, High-Power Laser Power Meter," by Alexandra B. Artusio-Glimpse, Ivan Ryger, Paul Williams and John Lehman, at 10:30 am on June 28, 2018, at the Wyndham Orlando Resort International Drive, Orlando, Florida, United States.